Next we will add support for external authentication. This is really easy, because all you really need is an ASP.NET Core compatible authentication handler. ASP.NET Core itself ships with support for Google, Facebook, Twitter, Microsoft Account and OpenID Connect. In addition you can find implementations for many other authentication providers here. To be able to use Google for authentication, you first need to register with them. This is done at their developer console. Create a new project, enable the Google+ API and configure the callback address of your local IdentityServer by adding the /signin-google path to your base-address (e.g. http://localhost:5000/signin-google). The developer console will show you a client ID and secret issued by Google - you will need that in the next step. By default, IdentityServer configures a cookie handler specifically for the results of external authentication (with the scheme based on the constant IdentityServerConstants.ExternalCookieAuthenticationScheme). The configuration for the Google handler is then using that cookie handler. After authentication with the MVC client, you can see that the claims are now being sourced from Google data. You can add an additional external provider. 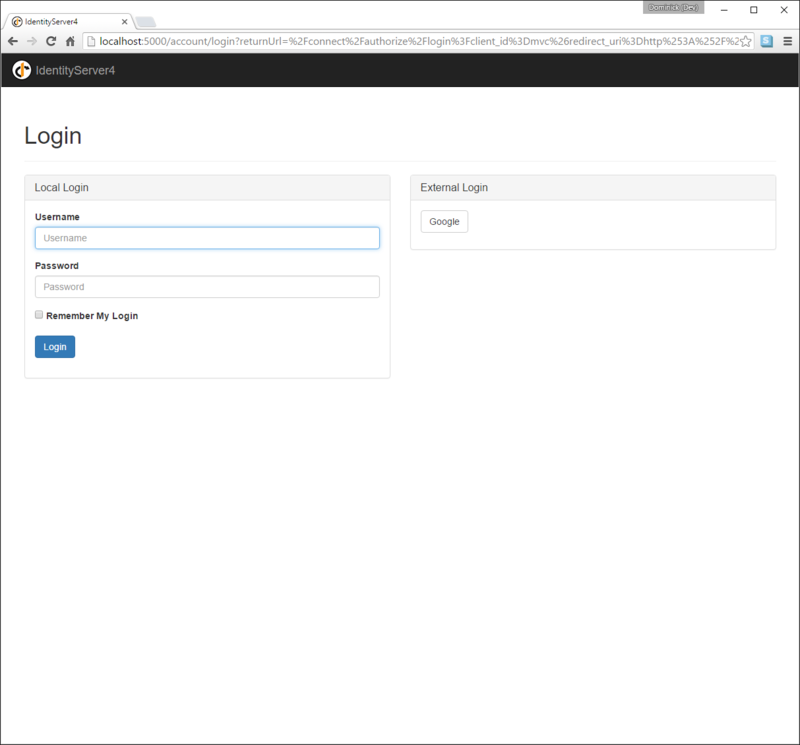 We have a cloud-hosted demo version of IdentityServer4 which you can integrate using OpenID Connect. And now a user should be able to use the cloud-hosted demo identity provider. The quickstart UI auto-provisions external users. As an external user logs in for the first time, a new local user is created, and all the external claims are copied over and associated with the new user. The way you deal with such a situation is completely up to you though. Maybe you want to show some sort of registration UI first. The source code for the default quickstart can be found here. The controller where auto-provisioning is executed can be found here.